This page provides you with Board Member resume samples that you can use for inspiration in writing your own resume, or for creating one through our easy-to-use resume builder. Below you'll find our how-to section that will guide you through each section of a Board member resume. Are you one of those professionals aiming to become a board member and who believe their resume do not matter as much as your networking ability and/or your professional achievements? Well, we do not blame you. These two qualities are fundamental when it comes down to applying to be a board member of any organization, although a resume can be as convincing as those two, especially in this competitive industry (to say the least!) We can help you get the perfect Board Member resume sample that will get you to that position you’ve been wanting for a while! We have helped quite a few board members so far and we want you to be next :) Let us inspire you! How to Write a Baord Member Resume? If you were actually the recruiter for this position, what would be important to you? Would you consider yourself a strong candidate? These three answers will help you understand how to structure your resume to showcase how you are the most ideal candidate to meet those needs listed in the job description! We strongly suggest you use a format that includes your work history, education and a brief summary of your skills. Fonts are important, make sure you don’t use any funky ones; we also suggest you to leave a few white spaces to let your resume “breathe”. Oh, and repeat this after us: PDFs are the best format! You do not want Microsoft Word to be the reason of your rejection, as they unfortunately mess up most layouts. It’s easy to say you don’t want to add a summary and that it’s too much trouble but it’s a crucial part of your resume. A summary can be the window into the professional, your 45-seconds pitch to the recruiter or the person in charge of potentially hiring you as a board member. Have a professional writing view. Go over skill sets and talents you bring to the role. Forget to use bullet points. Run the summary run on for three paragraphs. List points about what you want to gain from the role. Filling in the blanks of your work experience can be important as employers need to know about you and your past employment. In most cases, employers refer to your experience to determine if you’re the suitable candidate. Listing a few roles can be crucial in getting the position as board member and there are lots of experiences you probably have which can help. If there are however, some gaps in your employment history, it’s good to discuss them so the employer doesn’t think you’re trying to hide something. It might be a leave of absence because you were unwell or that you took time off to be with your family. However, it could be that you’ve been between jobs and looking for work. Explain and keep yourself right. Discuss why you are suitable for the position as board member. Discuss previous compensations as a board member. Discuss personal details from previous employment. For more tips on writing the best work experience section for a fantastic board member like you, check out our detailed resume guide. Education truly plays a key role for recruiters when it comes time to decide which professional they get onboard. Even board members have to list their education as recruiters want to see the type of person you are and, while they do take education into consideration when choosing someone new, it’s not the only factor they think about. That essentially means there’s no need for you to lie about your education. The name and address of where you studied. The number of years you studied. The name of the course taken. Education sections within resumes can be precise and even though there may be one or two little gaps, it’s nothing to be too concerned with. Of course, it really does help to have the basics down, even if it ends with high school or junior college. This is probably the most underestimated section of resumes. “Skills are not that important, a great recruiter will get them from my resume”. WRONG! What about those keywords recruiters will be searching on, in the middle of the tens and tens of resumes they’ll receive? You have a chance to include the most important keywords in your skills! You don’t just want to talk about the skills most people have such as good communication and determination but focus your soft skills and hard skills. You want to try and match these up so that you can create a list of skills which employers will be impressed with. Hard skills are more job-oriented while soft skills are what you have as a person. Combining these two skill sets together can be wonderful and a very simple way to get the employer to notice you. We can help you to make creating a list of skills easier. A cover letter has demonstrated to be a useful tool for everyone. Not only you should get one, but you should also check out our most recent tips here. Always keep the resume simply written. Tell lies or use misleading information. Add rude words or offensive language into your resume. 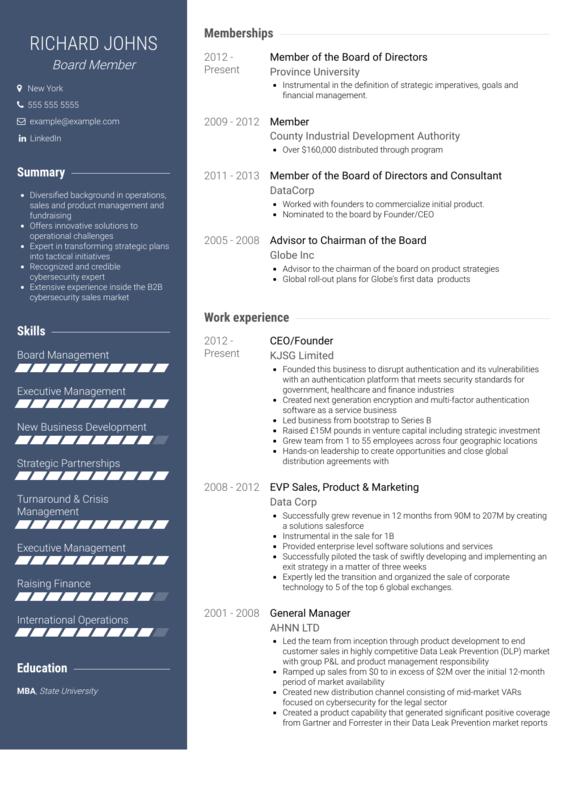 We have given you tips for the best Board Member resume sample: now, if you are also looking for standout board members resume templates, you should check this masterpiece we have been working on here : many professionals like you have successfully used it to take their career to the next level.